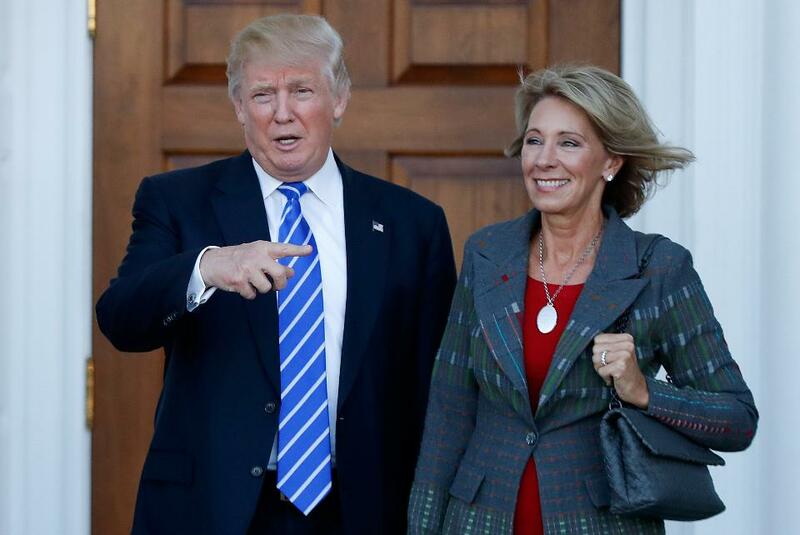 President Donald J. Trump walks side by side with Secretary of Education, Betsy DeVos. The senate confirmed DeVos to the post after Vice President Mike Pence broke the Senate deadlock with his vote to confirm her nomination. No matter your political affiliation, no matter who you voted for, if you support education in America at all, the approval of Betsy DeVos for Secretary of Education should irk you. DeVos was confirmed as secretary with the tie-breaking vote of Vice President Mike Pence, the first time in history a tie needed to be broken to confirm a presidential cabinet nominee. Half of the senate does not have faith in her leading the department of education. The reasoning behind their skepticism is no mystery either. In a series of questions by Tim Kaine (D-Virginia) to DeVos, she spurts out rehearsed, very politically tuned answers without displaying that she has the competency for the job, or without displaying that she supports anything that will improve schools. DeVos replies with yet another, “I support accountability”. This political maneuvering is nothing new at all but her avoidance of issues and her obvious incapability should make any school supporter nervous. This fumbling answer is just one of many examples as to why DeVos was a poor choice as Secretary of Education. With very little experience in public education, and views that won’t do much good for schools, it is concerning looking forward into the future of American education with Betsy DeVos at the head of it.